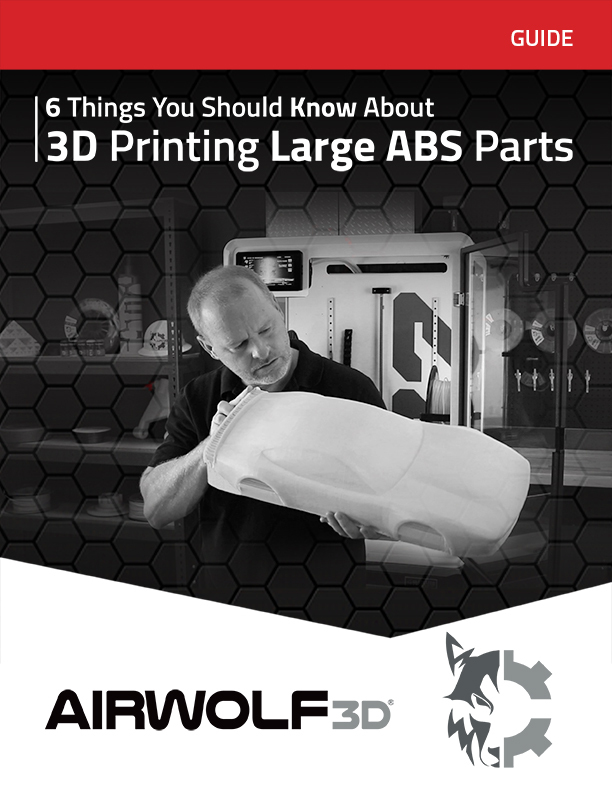 Hi, my name is Erick Wolf and I’m the founder of Airwolf 3D and the lead designer of the AXIOM 3D Printer. The idea today is to show you quickly how to get started using this large 3D printer. The AXIOM’s frame and construction were specially designed to retain heat within the printer. Retaining heat inside a 3D printer is absolutely critical when printing with materials like ABS and Polycarbonate. When cool air makes contact with these materials, the parts can warp and crack. We designed the AXIOM so you can print for at least a week straight using these materials (especially ABS) and get stunning parts. One of the beautiful things is that we’ve done this all in a desktop form factor. This is the only large 3D printer in the world that’s enclosed, can fit on your desktop, and can make parts even approaching the size that you can make with the AXIOM 3D Printer. How did we create this large 3D printer in such a compact package? We spent thousands of hours coming up with the ideas to roll everything into a very compact package. 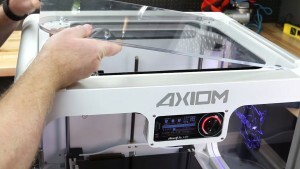 The size of the AXIOM 3D Printer build platform is 12.5″ x 8″ x 10″ — that is a massive 3D print! We’ve done really large objects like an engine in ABS. We’ve also done sculptures that are 10 inches high without any cracks on them. 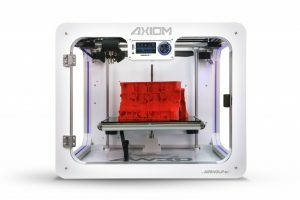 The only way you ever could do that is with an enclosed chamber; that was the most important design consideration for the AXIOM 3D Printer. If you look at any other large 3D printer with a comparable print volume, they’re massive, they weigh hundreds of pounds, and they cost tens of thousands of dollars. We achieved our design by taking everything that we learned from making 3D printers over the last three-and-a-half years and combining it with input from customers as well as all sorts of creative ideas. We made a highly compact drive system, a CoreXY system, that is lightweight and very low profile. The motors, belts, rods and bearings are all tucked into an area approximately 2.5 inches in height. In addition, we use a compact Z mechanism with a bed and a single precision lead screw. We also have the noble way of sealing the top of the machine while keeping the hot-end very close to that portion. If you’ve seen other desktop 3D printers that attempt to enclose their design, there’s always a big tube popping up at the top that gets loose and becomes unmanageable. Another key feature of this large 3D printer’s design is its easily removable acrylic top. Simply pop the piece of acrylic right off and you can have access to anything you want. The entire print mechanism is contained within four inches. position as it travels across the top of the printer before transitioning back down to a vertical position. The tube goes in and out of the back of the machine, extends into the circuit board and back into the feed mechanisms. As you’re running the AXIOM 3D Printer, you never realize all that’s going on inside of this machine. The design makes it so easy to use and so compact. In fact, one of the benefits of the AXIOM’s design is that you can stack the printers on top of each other. You only have to make sure that they’re secured to the wall, but physically the machines will handle it. To enclose this volume, you can’t just print out parts and expect them to last with all that heat in the chamber. We have a combination of injection molded polycarbonate and aluminum extrusions, along with interior pieces made out of both ABS and printed polycarbonate. The result is a rugged, fully integrated system that keeps tolerances and also heat in at the same time. 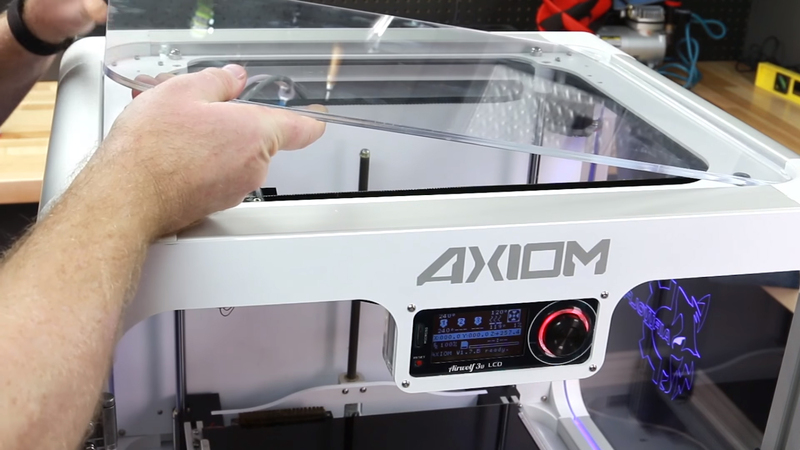 The AXIOM 3D Printer is incredibly strong, with a lot of aluminum and polycarbonate bolted and fastened together. We have an aluminum-intensive heated bed section and aluminum back plate. In addition, the roads are steel and precision ground. All of these elements culminate in a very strong machine that you cannot break and that will give you tight tolerances — a machine that can be treated like a tool needs to be treated. The whole idea here is that we want to provide you with a tool to use for 3D printing. 3D printing is an activity, but it’s not a game. This isn’t a toy to use to make trinkets (although you could if you wanted to). This is a professional machine that is easy to use: Simply press the “on” button and it will make your part. 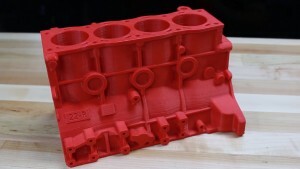 This entry was posted in 3D Printing Tips & Tricks, Blog, Featured and tagged Erick Wolf. 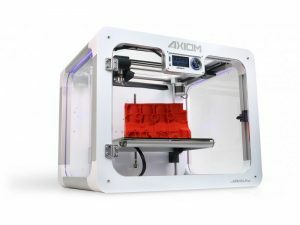 Looking to buy 3D printers for your school?